The S.S. Nomadic is a tender that was specially designed and built by White Star to serve the Olympic Class ships. 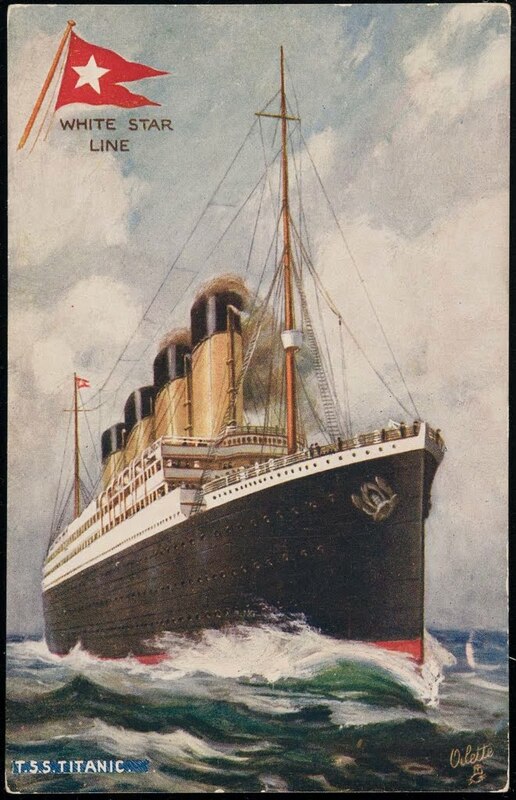 Olympic and Titanic were so large that they could not dock in Cherbourg, France, but had to wait off shore while Nomadic and her sister ship Traffic, brought passengers from the dock to the ship. Nomadic still exists today and is under restoration at Harland and Wolff in Belfast, Northern Ireland. She is the only surviving vessel of the White Star line. Nomadic's keel is laid down at Harland and Wolff shipyard in Belfast. Nomadic is delivered to the White Star Line. Nomadic arrives in Cherbourg, France. Nomadic services RMS Olympic at Cherbourg. This was Olympic's maiden voyage and first stop on her way to New York. Nomadic ferries 142 first class passengers to Titanic. This was Titanic's maiden voyage and first stop on her way to New York. Image from James Cameron's 1997 film "TITANIC"
Nomadic receives a covered bridge. SS Nomadic with covered bridge. Nomadic is requisitioned by the French government, and is sent to Brest to serve as a troop ship for the U.S. 7th infantry division for nearly 2 years. Nomadic returns to commercial service. 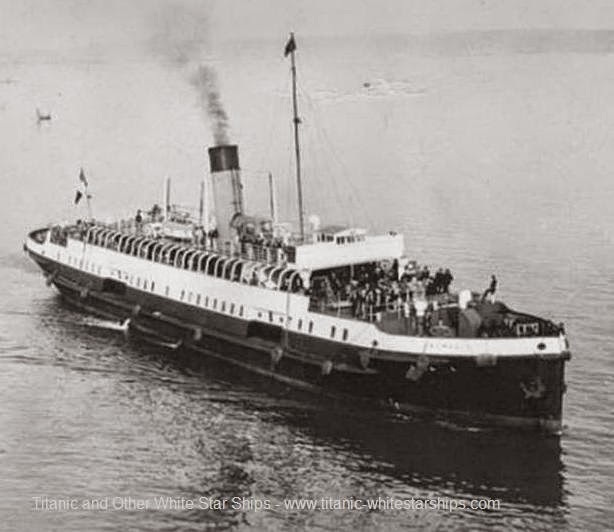 The first ship she tenders is the Cunard Line's Coronia. Nomadic is involved in a collision with the liner Orinoco. Cherbourg opens a deep water berth making tenders redundant. Nomadic is purchased by Societe Cherbourgeoise de Remorquage et de Sauvetage (SCRS) and is renamed Ingenieur Minard. She is dry docked in Cherbourg for essential repairs before continuing to serve some of the world's most famous liners. Nomadic helped to evacuate soldiers and workers from the French aviation company Amiot to escape the German army. Nomadic sails to Portsmouth and is requisitioned by the British government. She spends five years as a troop ship, ferrying soldiers from Portsmouth to training camps in the Isle of Wight. Nomadic is saved from scrapping by her former owner SCRS. Nomadic is busy working at Cherbourg due to the harbor being virtually destroyed by the German army during the war. When the quays are restored, she becomes redundant and is kept for times when vessels can not berth. She also continues to service some visits of RMS Queen Mary and RMS Queen Elizabeth, the two largest liners in the world when they can not tie up at the quay. Cunard White Star's RMS Queen Elizabeth with Nomadic in the lower left corner. At this point in her career Nomadic was named Ingenieur Minard. 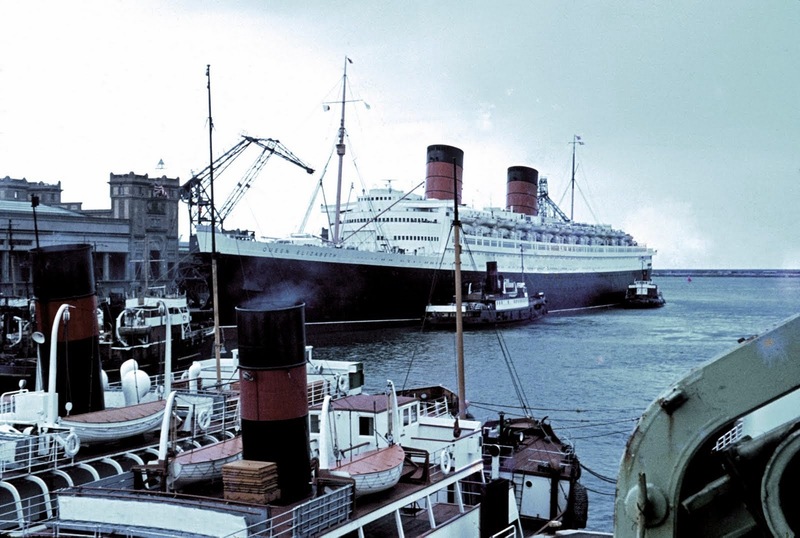 Nomadic serves the RMS Queen Elizabeth for the last time. Pictured Below: RMS Queen Elizabeth with Nomadic docked in the lower left corner. French businessman Roland Spinnewyn purchases Nomadic and tows her from Cherbourg to Conflans Sainte Honorine with the intention of transforming her into a floating restaurant. Spinnewyn decides his dream is not practical, so Nomadic is sold to entrepreneur Yvon Vincent. Vincent opens Nomadic as a floating restaurant and function space on the River Seine in Paris where she plays host to many events and concerts over the following 22 years. Details of her internal layout are changed by each new tenant. Nomadic on the River Seine in Paris serving as a floating restaurant. Nomadic is closed due to Health and Safety regulations requiring annual inspections of her hull in dry docks. Nomadic is towed out of Paris and down the River Seine to Le Havre. Nomadic is purchased by the Department of Social Development. 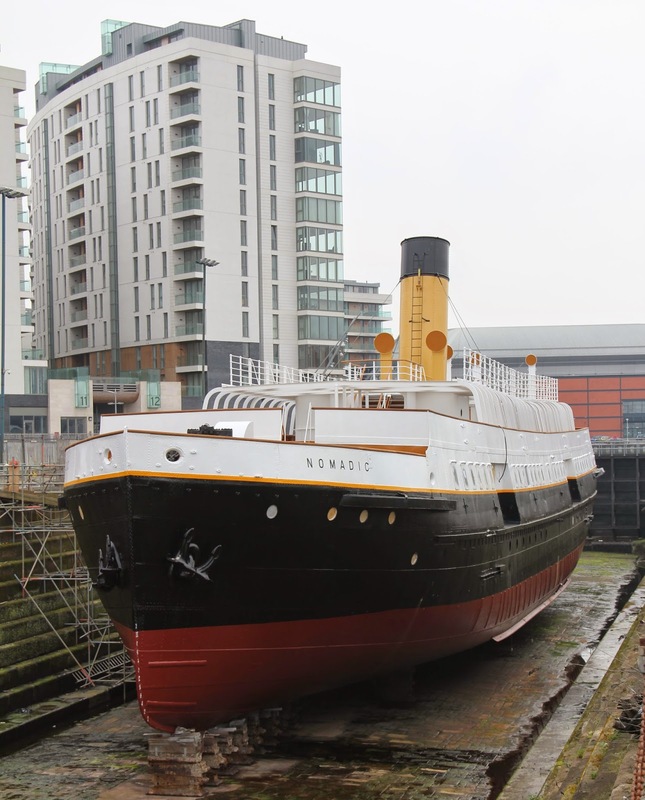 After 95 years Nomadic returns to Belfast for restoration. 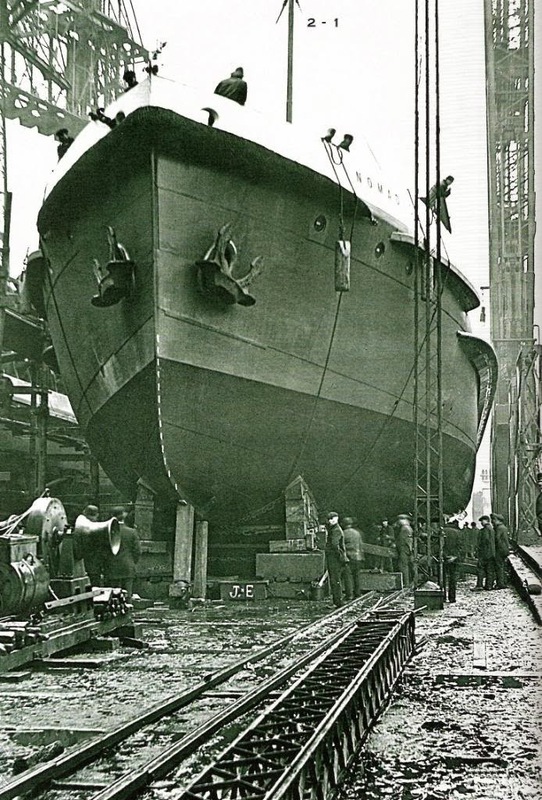 Harland and Wolff continue the restoration project of Nomadic. While the restoration is on going, Nomadic serves as a museum and is part of the new Titanic Quarter and Titanic Belfast attraction in Belfast, Northern Ireland. Nomadic as she currently looks today in Belfast, Ireland.